My first venture into the shellfish arena of bacon book recipes. I love oysters in any form so I figured, hard to go wrong with this. I got 5 freshly shucked oysters from our local wonderful seafood market, Monahan’s. The oysters were from Cape Cod, and I think Mike Monahan said they were called Wiona oysters, but it might have been Wionna. 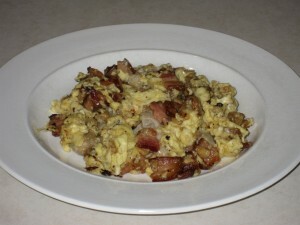 I had 3 large free range eggs, and 3 thick slices of Nueske’s Applewood Smoked bacon. My deviation from the recipe though (which I don’t recommend!) 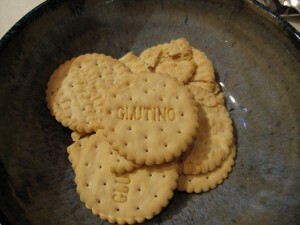 was to use Glutino gluten-free crackers, rather than oyster crackers. I don’t know of a gluten-free source for oyster crackers, yet. So anyway, I coated the oysters in the too-chunky crushed crackers, and let them sit. 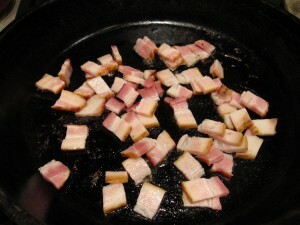 Meanwhile I chopped up the bacon, and fried it til crisp, and took it out of the pan, leaving the fat. Then in went the oysters, for about 2 mintues as directed, and my cracker crust did get nicely golden brown, just not a uniform coating on the oysters. Then this last part of the recipe was very quick – the oysters cooked for just 2 minutes, then in go the beaten eggs, bacon, salt, and pepper, and it only needed to cook for probably another 2 minutes, gently stirring, and it was done. Was a hearty dish, more than I can usually face for breakfast but excellent for a brunch or lunch. I love the flavors of the oysters and bacon together. I had used 3 slices Nueske’s but I think only 2 are needed. (Nueske’s slices are fairly large though.) If you like oysters this is a great dish and super-quick to make. Oysters, eggs and bacon in one really good all-American dish, Hangtown Fry is a California classic that’s long been one of the most popular items on the Roadhouse brunch menu. I love it because it’s simple to make, it’s delicious and it’s got a great story to boot. I like to use a dry-cured bacon like Broadbent’s because that’s the sort of intense, long-cured bacon that Gold Rush-era cooks would likely have been working with. The story of Hangtown Fry takes you to a northern California town originally known as Old Dry Diggins, then as Hangtown and now Placerville. Back in Gold Rush days it was a prominent supply town – many of the area’s miners went there to restock and cut loose, and, while they were at it, often got themselves into a bit of trouble. The name Hangtown came about in the middle of the nineteenth century, when three bad guys were strung up on the branches of a big old oak in the center of town. I’ve been told that the stump of that old oak is still “stuck in the mud” (so to speak) in the basement of a bar called The Hangman’s Tree (which you’ll be able to find quickly by the body hanging from a noose off the front of the building). The dish is said to have originated at the now-defunct El Dorado Hotel, just across the street from the hanging tree. Legend has it that a miner rolled into town with gold from a fresh strike and ordered the saloonkeeper to serve up his most special dish. 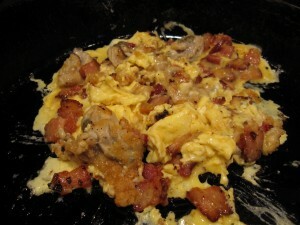 The cook offered a choice of three high-end options: oysters, eggs (hard to transport and hence costly) and bacon. The miner told him to toss all three into one dish, and Hangtown Fry was born. It’s a very versatile recipe – great for brunch, lunch or a light supper. Don’t skimp on the egg quality – remember, they were a luxury in mid-nineteenth-century Hangtown and remain a key component of the dish, not just a way to hold the oysters and bacon together. Since I almost never see single-serving recipes in cookbooks, I decided to design this one that way. But of course the quantities are easily increased for any number of diners. You can vary the number of oysters according to how much gold you’ve got in your pouch. 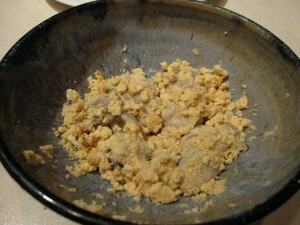 Dredge the oysters in the cracker crumbs. Leave them resting for at least 10 minutes so that the crumbs bond with the oysters. In a non-stick skillet, cook the bacon over medium heat until crisp. Remove from the pan, leaving the bacon fat. Reduce the heat a bit and add the additional measure of fat. 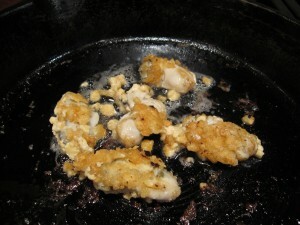 When hot, add the oysters and cook for about 2 minutes, stirring gently, until the crumb coating is lightly browned. Add the beaten eggs, salt and pepper, and stir gently. Add the bacon. Cook over low heat, stirring gently every 30 seconds or so, until the eggs are done as you like them. Serve with San Francisco sourdough toast and “Folsom Prison Blues” playing in the background. 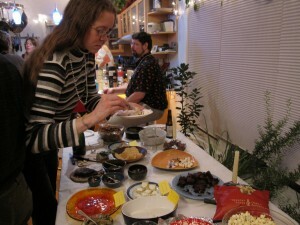 We throw a New Year’s Eve party every year, and while our guests bring lovely snacks to share we always make some too to seed the food table with. This year of course I decided mine should be bacon-based. So, I chose the Benedictine with Bacon recipe from the Bacon book. First you peel and de-seed the cucumbers. This always seems a bit odd, in that it seems like you’re getting rid of most of the cucumber when you take out all the “guts”, but these cukes were large and really there was plenty left. Then I grated the cucumber, and put it in a sieve and squeezed out the water. And chopped up some onion. Then put it in the fridge for a couple hours. 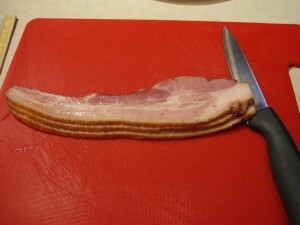 During that time, I cooked 8 slices of Broadbent’s bacon, on a rack in the oven, at 350 F, for 20 minutes or so. I watch it closely, since I’ve overcooked Broadbent’s before. 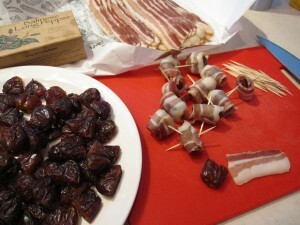 It is a dry-cured bacon so has less water than conventional bacon, and cooks faster I find. And its a bit deceptive in how it looks, too – it gets stiff and dry when overdone, but doesn’t look burned, so in order to tell if its done I’m looking at both the color and the flexibility – I want to take it out while it still has some bend to it. I patted the bacon with paper towel to take off some of the fat, and set it aside for a little while, until I was ready to assemble. Just before the party, I toasted some good white bread, and some gluten-free white bread too. (There is a bakery in Toledo that makes decent gluten-free bread that my grocery store carries, called Pure and Simple. It can’t approach the scrumptious-ness of real bread, but its much better than some of the others we’ve tried.) I cut the crusts off just because it seemed the thing to do – maybe I was having flashbacks to a high tea I ate at Harrod’s in London when I was in high school. I put the two breads on three different plates (the third plate for the bacon-free), and took the Benedictine out of the fridge. It had thickened some, but was still a bit runnier than I had thought it would be. Maybe its because I was using Zingerman’s Creamery cream cheese – which has no guar gum, the standard thickener for commercial cream cheese. But it tasted wonderful – light, fresh, and cucumbery with a gentle onion bite – so it was way worth it to not have guar gum in there! I spooned a bit onto each piece of toast (probably between 2 to 3 teaspoons per), broke the Broadbent’s up into inch-long pieces and placed a piece carefully on top, on two of the three plates, and served! 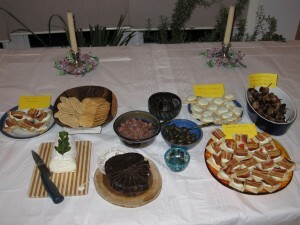 And here’s the snack table near the end of the evening – the two plates of Benedictine with Bacon and the Bacon-Wrapped Dates with Long Pepper were emptied long ago, but the vegetarian plate is still hanging on. It was eaten too though, just not as quickly. The credit for inventing Benedictine spread goes to Jennie Benedict, a seemingly pretty powerful personality who studied with Fannie Farmer and went on to become one of Louisville, Kentucky’s top caterers. She was the first woman to sit on a Board of Trade in the South. In 1902 she wrote a book called the Blue Ribbon Cook Book, in which she first described this spread. Over the last hundred years Benedictine has become to Louisville what paté is to Paris or baked beans are to Boston. Beyond that bit of background, I don’t have a huge heck of a lot to tell you about Benedictine other than that it’s really, really good and Louisvillians definitely do pretty uniformly seem to love it. The first time I had it was at Lilly’s, which is one of the best restaurants in the city. It wasn’t on the menu but when I told Kathy Cary, the chef and owner, that I’d never eaten it she went straight to the kitchen and came back 10 minutes later with a plate of little Benedictine-filled finger sandwiches. I really liked the stuff, and I think pretty much anyone who likes cream cheese would like Benedictine. 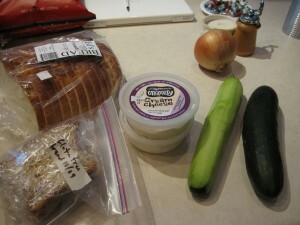 Every recipe calls for cream cheese, and they all have cucumber as well. Most have some onion. A few add other spices. The better the cream cheese and the cucumbers, the better it’s going to be. Many locals add green food coloring, which I think was probably a pretty common ingredient back in the early years of the twentieth century (color was an important part of the way people approached food in that era of “scientific cooking,” and the dishes of a meal were often color coded). Personally, I skip the green, but Kathy’s husband quickly reminded me that rather surreal green color is the one I’d see in most supermarket deli cases. Part of why I like our Benedictine so much is because I’m so smitten with the traditional, hand-made cream cheese from Zingerman’s Creamery and this is a really good, regionally authentic way to eat it. I like to look at it as sort of a high-society, upper-South version of bagels with smoked salmon and cream cheese (slices of pork instead of salmon makes sense when you’re hundreds of miles from the sea). 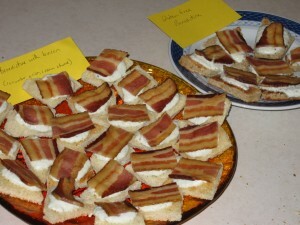 The other reason is because it’s really good with bacon—Kathy made that clear by topping each of the little sandwiches with a half slice of the stuff. Which is why it’s in this book! I’d use Broadbent’s or Father’s to stay true to the Kentucky origins of the dish. Drain the grated cucumber in a fine-mesh sieve. 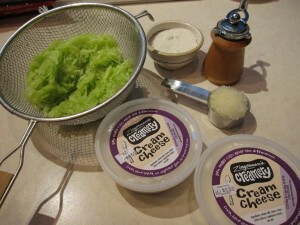 Combine the cucumber, cream cheese and onion in a food processor. Transfer to a bowl and add salt and pepper. Cover and let the spread set up for a couple of hours, refrigerated, to assimilate the flavors. 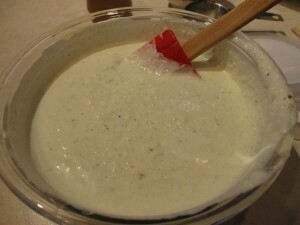 Remove from the refrigerator about 30 minutes before serving. When you’re ready to serve, fry the bacon over medium heat until slightly crisp. While it’s cooking, toast the bread. When the bacon’s done, drain it (save that fat!) 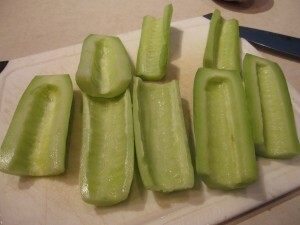 and cut the slices into quarters. When the toast is done, cut it into quarters as well, spread on the Benedictine and lay a bit of bacon on top. Serve on a genteel, socially acceptable platter!